This is the Internet site for the WinRD+ contest logging software. VK6FJA participating in the RD contest then (1987) and now (2006). "Yes, after 20 years of AR, I still like RD Contests." Back in 2003, I was using a DOS based program (by VK6AD) for the RD contest. The software turned out to be excellent software for the RD contest. It was so good that I decided in 2003 that I needed to improve it, as during the contest I always wished for the odd few extras which could not be offered easily by the original software and converting the software to Windows seemed to be a good idea at the time. What resulted 2 years later (in 2005) was WinRD+, a completely re-written program in Delphi which has very similar functionality to the original logging software, but with all the extra things added to it. I liked the original software so much that I made the log files and initialisation files compatible, such that one could load in a log file created on the old DOS version and also re-open a WinRD+ log file in the DOS version again. WinRD+ includes features like, printing the logbook and summary sheet, editing or scrubbing contacts live during the contest and being able to show dupe contacts. 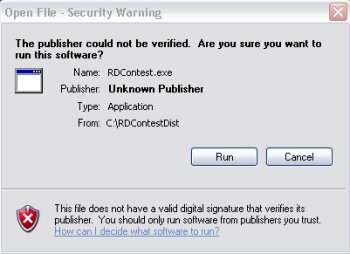 This means that you no longer have to quit the RD program and start an editor like Notepad or Wordpad to edit the text based log file which can take up valuable time in a contest pile up (although you still can if you like). Also if you always wanted to know which stations you had already worked in the contest and were able to work under the repeat contact rule, then rather than keying in each callsign multiple times to find out, a mere glance at the Dupe window will tell you who is able to be contacted again. The program will play an error sound if you can't work a station and will store each operators name in the log. All the latest rule changes should be incorporated in the current version of this software. When you're finished in the contest - simply click "Email Log" to send in their logbook without having to print or manually create an email to the contest manager (**NB However please check the log file prior to doing this in the program). If you operate in the Remembrance Day contest, you will find WinRD+ an excellent choice to handle your logs and to make working stations in the contest easier. For the last few years, this software was Shareware. Due to the small numbers of people registering the software (less than 50), I decided to cease bothering with the shareware concept as it makes little sense and has only made extra work in coding the program. From 2007 onward the program will be completely free, however donations from those who like using it would be appreciated. Anyone who donates or has registered will get updates on the latest changes to WinRD+ and also get support for using WinRD+. Also some pre-release versions will be available to those who have supported this program's development. So what happened to all the money from previous registrations you ask? A donation of $100 was made to the Northern Corridor Radio Group on 27-Feb-2007 from the proceeds of this software, so it all goes back into supporting a good cause. I hope to do some further work on this software, or even re-write it so it can be used on OS-X, Linux and other machines, more than likely this will be a JAVA, or C++ based version. Time has got the better of me since 2008 so there have been no major upgrades this year, however please make sure you are running the latest version. Finally, if you don't like WinRD+, I have listed a number of links on this site to alternate packages (just click on "links" in the menu, but being the author, I believe that WinRD+ is the best application :) . Enjoy using WinRD+ whichever way you decide to use it..
For further details about the contest, see the W.I.A. page. VK4OD is the 2010 Contest Manager. Rule changes are now incorporated..
*Full compatibility with the VK6AD RD contest software logs. * Automatic contact checking and automatic RST sent logging. * UTC Time and Date display with "Contest Time Left" shown. * Can be run in a window or in full-screen mode. * Unlimited number of logbook contacts - until you run out of memory. * Real time contest points score display and band summary selectable. * Automatic double points score between 1am and 6am local time. * Automatic double points score on 160m, also 23cm bands and above. * Log book stored in comma delimited format for easy import into other programs. * Multiple copies of the program can be run together on the same PC. * Live editing and deletion of contacts - no need to exit the program and use an editor. * A "QSO Pending" Dupe Screen telling you who can be contacted again (repeat contacts rule). * Print your log and summary sheet from the program with automatic page total scores. * Adjust the screen / window colours to your liking. 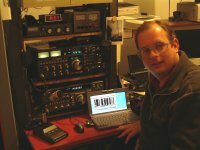 * Change and use sounds for QSO Dupe's and log errors. * Email your log directly from the program to the contest manager after the contest. No printing needed (save paper), no trying to format messy files - format already checked with contest manager..
* Supports both VHF/UHF and HF use**. * Use the ENTER key to move between entry boxes - it's fast and was how the program was designed - if you tab or use the mouse then you may run into problems as not all other scenarios have been error tested yet. *Try to use 1024x768 screen mode with normal fonts (96dpi) in Windows. I've had a few problems with other screen sizes - however they should work. Maximise the window if you like but the dupe display does not like all types of windows screen types. 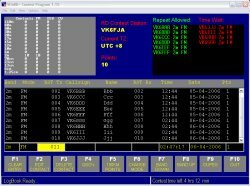 *If you make a mistake in the contact - just scroll back to it, double click or select the contact and edit (F2) it live - there should be no problem in doing this - if you get used to using the ENTER key then you will soon work out just how easily the program functions..
*To run the program for both HF and VHF on the SAME PC, please make sure you copy the program RDContest.exe and your log file (e.g. RDHF.LOG ) into a different windows folder. Create two shortcuts to the different log book folders if required and change the name on one - then you will have no problems. *Graphical printout still only works on a 600dpi printer. Use text printing if you need to print the log. But why print it out, just email it direct to the contest manager from the program. Just make sure you are connected to the Internet and know your outgoing SMTP mail server address. *Set your PC clock to your usual local time and timezone - no adjustment required as the program will work out UTC time for you. *If you need to change or enter extra things in the logbook that can't be done with WinRD+, simply exit the program and edit the RDVHF.LOG or RDHF.LOG logbook file in Notepad or Wordpad. Then restart WinRD+ and it will re-read the log with changes. You may choose to export the log after the contest using this method as well. The log is text based - no strange database format has been used. How to install WinRD+ ? 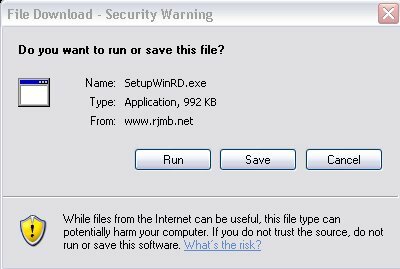 WinRD+ is very simple to install. Simply run the SetupWinRD.exe file. The RDContest program will then appear in your start menu. To remove the program entirely, just use the uninstall icon or remove it from your programs in control panel. But beware, don't delete your logbook. You can run WinRD+ multiple times in Windows - but beware, make sure each either runs from it's own folder / directory and that it is working on a different log book file! This should cause you no problems - just click "Run" to allow Windows to run either of these programs. Copyright © 2010 by James McBride Last modified: 12th August 2010.